Training your dog can be tough if he’s easily distracted and finds it hard to concentrate. Stimulating these acupressure points can help him focus and learn. Many trainers and guardians begin training sessions with acupressure to help their dogs settle comfortably into a physical and mental space where both animals and humans can work together. 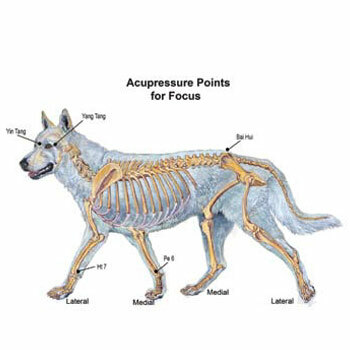 Acupressure can help both of you focus and gain the most out of a training session, even if your dog is initially distracted, anxious or unwilling to engage in training. The first step in a productive training session is for you to center your thoughts and energy. If your thoughts are elsewhere, your dog will know it. 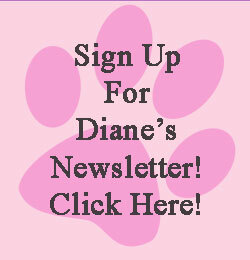 Dogs are highly perceptive and will not focus well if you are thinking about something other than training. One method for releasing extraneous thoughts and energy is to breathe. Inhale slowly, filling your chest. Hold your breath momentarily then exhale, adding a little force as if you are pushing your breath out and away from you. Repeat this technique three to six times until you feel more relaxed and clear of mind. Once your mind is clear and stress has dissipated, look at your dog and imagine what a focused and perfect training session you are going to have together. Slowly and with intent, stroke his back three times from his shoulder to his hindquarters on each side of his spine. Then, take another moment to envision how enriched and productive a time you are going to share. Now that you’re focused, it’s time to increase your dog’s receptivity to training by performing a brief acupressure session. Acupressure is based on Traditional Chinese Medicine (TCM) theories. According to these ancient concepts, specific acupressure points (acupoints) found along energetic pathways or “meridians” on the body are known to have particular healing effects. Some have a calming effect on both humans and dogs. Others help with the ability to focus. The following acupoints have been selected to enhance training by calming and clearing your dog’s mind so he is less susceptible to distractions and more able to give you his full attention. Yin Tang Point: Located on the midline of the dog’s head just above the level of the eyes, in the “third eye” position. This point is one of the classical acupoints used specifically to draw mental energy into focus. It’s the point to use when your dog is distracted or anxious. Yang Tang Point: Another classical point to be used when your dog is overly focused on one thing and not able to diffuse his attention and pay attention to you. When a dog is aggressively fixated on another dog, this acupoint can break that focus and you can get his attention. The Yang Tang point is located lateral to the outer canthus of the dog’s eye in the soft spot above the zygomatic arch. Note: The Yang Tang Point has the opposite effect to the Yin Tang Point. That is, the Yin Tang Point draws in the dog’s focus when he is distracted, hyperactive or anxious. The Yang Tang Point diffuses the dog’s intense focus so you can draw his attention to you and the training. Heart 7 (Ht 7), Spirit’s Gate: This point is known to calm the dog’s spirit as well as strengthen and clear his mind. It is located just above the “wrist” (carpus) on the forelimb, in the depression (slightly lateral) formed by the tendon and the joint. Pericardium 6 (Pe 6), Inner Gate: This point supports the bonding process by allowing the animal to reduce pretense and build trust. It also clears the mind and calms the spirit while enhancing the smooth flow of energy throughout the dog’s body. Pe 6 is located on the forelimb above the wrist on the inside (medial aspect) of the forelimb. Bai Hui, Heaven’s Gate or Point of 100 Meetings: This classical point for animals is located at the lumbosacral junction where it feels like a small soft trampoline with no spinous processes sticking up on the dog’s spine. Most dogs love to have this point scratched. The Bai Hui point relieves stress and opens the mind. 1• Thumb technique – usually effective on the head, neck and trunk. Place the tip of your thumb directly on the acupoint and hold the point gently, but with intent, for a slow count to at least 30. If your dog shows no reaction, you can hold the acupoint longer. After a reasonable length of time, move on to the next acupoint. 2• Two-finger technique – best for the limbs. Place your middle finger on top of your index finger to form a little tent, then place your index finger gently, yet with intentional firmness, directly on the acupoint. Stay there for a slow count of 30, or longer if your dog shows no reaction. Move on to the next point even if your dog indicates a release of energy. While doing these techniques, keep your other hand on the dog to feel for any reactions. You will know if the dog is moving energy and releasing if he yawns, licks, passes air or stretches. While proceeding through this session with your dog, picture all the benefits you’ll receive from the focused, productive training you’re about to enjoy!